The internet is a wonderful thing. If not, how else can you find two jazz fans discussing an "obscure" album from 1969 with asperity and insight. Prof. Drew LeDrew and Chilly Jay Chill dissect John Stevens' Spontaenous Music Ensemble. Kenny Wheeler, flugelhorn; Derek Bailey, guitar; Trevor Watts, alto sax; Peter Lemer, piano; Johnny Dyani, bass; John Stevens, percussion and glockenspiel; Maggie Nicols, Pepi Lemer, Carolann Nicholls, voices. 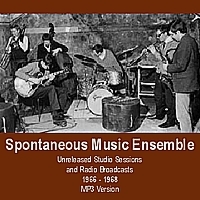 According to the Wikipedia, the Spontaneous Music Ensemble (SME) was a loose collection of free improvising musicians convened beginning in the mid-1960s by the late South London-based jazz drummer/trumpeter John Stevens and alto and soprano saxophonist Trevor Watts. Prof. Drew LeDrew (DLD): Is there a "British sensibility" in jazz? Is it expressed here? eldritch about the whole piece. A strange mix of minimalism and freak-folk. Like an unholy mash-up of Terry Riley and vintage Fairport Convention. DLD: So I guess you could say it's real British roots music. CJC: It's probably easier to hear those elements now than it was, say, 20 years ago. Especially since the whole folk thing has come full circle and reissues of avatars like Vashti Bunyan, Comus, and The Incredible String Band are totally in vogue. DLD: Hmm. Simon Reynolds has this brilliant piece in the new issue of The Wire (#273) about the Ghost Box label and a tribe of British electronic musicians who create their pieces by sampling the U.K.'s pop culture past. They use elements of library music, television and radio shows, Hammer horror flicks, and crucially, lots of English psychedelic folk music. I'm not exactly sure it directly relates to SME, but it seems like they were doing something similar. CJC: Of course SME were 35 years ahead of the curve. And conjuring their necromancy in real time with actual musicians. Not that one approach is better, just that the live aspect gives SME's experiments a different flava. DLD: Okay, so here's the bigger question: Is this even jazz? CJC: Why not? The length and sprawl of the piece - it travels for almost 19 minutes - certainly come straight from jazz. Ditto for the the free improv elements and the interactions between the musicians. DLD: After the steady vocal/sax drone begins, "Oliv I" actually starts to remind me of the soundtrack to 2001. Those haunting Ligetti pieces. Space is the place, except this piece is grounded by Wheeler's endlessly inventive playing and Bailey's sensitive interpolations. Wheeler almost singlehandedly keeps things interesting. I love how he blends a natural lyricism with an acute awareness of what's going on around him. CJC: John Stevens said he selected the performers for the piece and then began to organize the music around them "with the hope that they could contribute fully to the music as a whole and also retain their individuality." DLD: Which reminds me: There's no better source of SME-related information than Martin Davidson's remembrance of John Stevens, hosted at the European Free Improv pages. Go check it out. Click here to download Spontaneous Music Ensemble MP3s. Note: While Chilly Jay Chill and Prof. Drew LeDrew are the mainstay of the Chemistry Class blog (chemistryclass.blogspot.com - "You must give props to whom props is due"), they also run Destination Out (destination-out.com), an mp-free jazz blog focusing on rare or out-of-print music. As they say, requests, rants, and rights issues to destination.out@gmail.com.